First-century herbalist Dioscorides named this genus Petroselinum, deriving the name from the Greek petros, "rock," and selinon, "celery." The common name parsley derives from that genus name. Parsley, a biennial native to southern Europe, thrives in full sun to partial shade and in moist soils where limestone is prevalent. 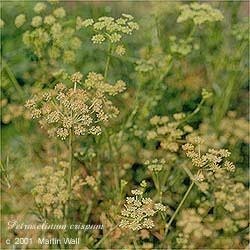 The hermaphroditic, aromatic flowers grow in compound umbels. The leaves are wavy and finely divided. Parsley's high chlorophyll content facilitates the body's utilization of oxygen, while its essential oils increase circulation to the digestive tract. The herb also helps reduce excess fluids in the body via its action on the kidneys. The leaves are used in the treatment of anemia, arthritis, cancer, cystitis, delayed menses, dysmenorrhea, edema, flatulence, gout, halitosis, infertility, jaundice, kidney inflammation, kidney stones, and rheumatism. They are also used to encourage convalescense. The seed is used as a galactagogue. Topically, parsley leaf can be prepared as a poultice to treat bruises, insect bites, and sprains; as a hair rinse to reduce dandruff and graying hair; as facial steam or lotion to relieve dry skin; or as an eyewash to soothe tired eyes. They also can be rubbed on the body to repel mosquitoes. The juice can be applied topically to treat toothache. The leaves are a poplar culinary seasoning. They are best eaten fresh and raw, rather than dried or cooked. The root of Petroselinum tuberosum can also be eaten, raw or cooked. The ancient Greeks believed that parsley sprang from the blood of Archemorus, the herald of death; soldiers avoided eating it before battle, and it was used to make wreaths for the tombs of the dead. Today, the essential oil is used in men's perfumes. Avoid large amounts during pregnancy; small amounts used for culinary seasoning are safe, however. Avoid excessive amounts of the seeds.